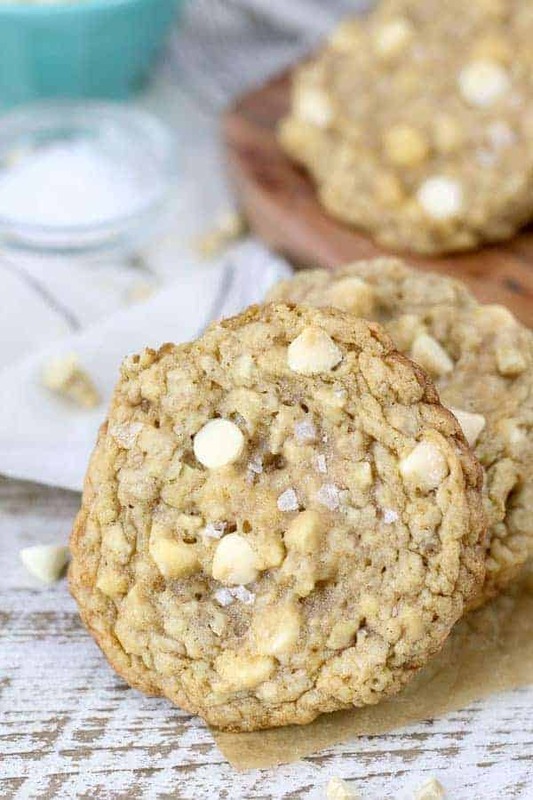 Mouthwatering and highly addictive, these Salted Caramel Cashew Oatmeal Cookies are soft and chewy filled with chopped cashews, gooey sea salt and white chocolate chips. Dare I say these are my new favorite cookie? Addictive. Sweet and salty. Buttery. Soft and chewy. These are just a few ways I’d describe these cookies. When I think about my holiday cookie baskets, I try and add some variety and include new recipes every year.Of course my cookie baskets will include some staples like mini sugar cookies, Snickerdoodles and maybe an Andes mint cookie cups or something like that. 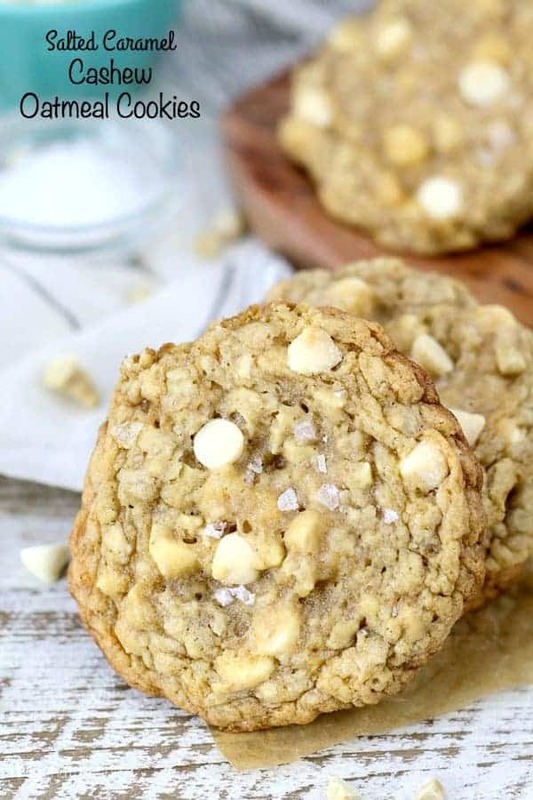 This year I’ll definitely be including these Salted Caramel Cashew Oatmeal Cookies. Oh my gosh are these good. 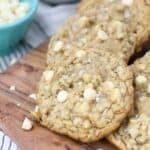 I adapted my other favorite Bourbon Salted Caramel Cookies for this recipe. 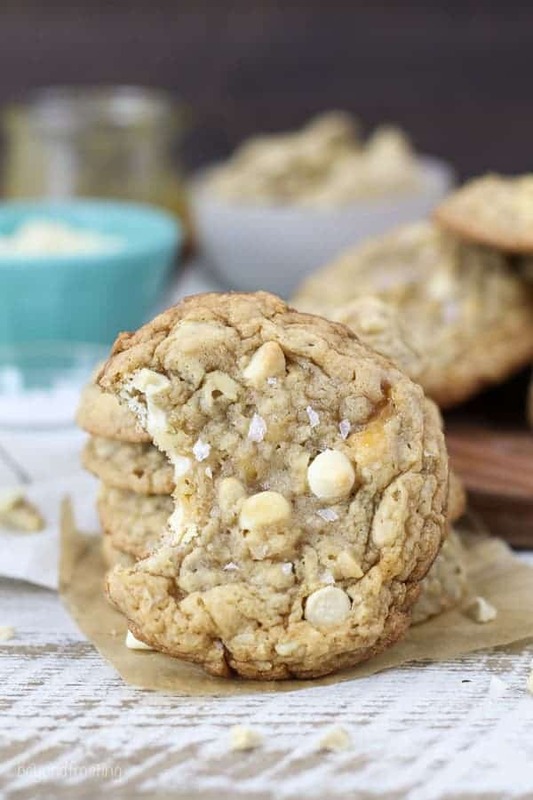 In these cashew cookie you’ll find chopped cashews, white chocolate and plenty of salted caramel. I can’t really decide what my favorite part is. The key to making the salted caramel is to melt the caramels with some milk or heavy cream because it will stay nice and soft when it bakes. I do like to allow the caramel to cool before adding it to these cookies otherwise it just melts the chocolate chips. 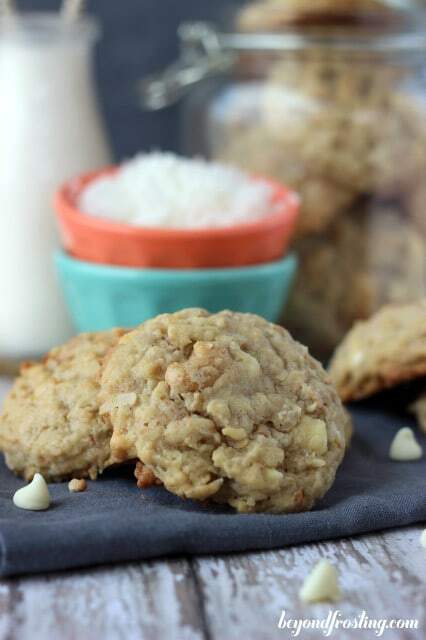 The one requirement for these cookies is that you refrigerate the dough for at least one hour. This helps the flavors mix together but also prevents the cookies from spreading too thin. I have one trick to share with you that I learned from my friend Hayley. 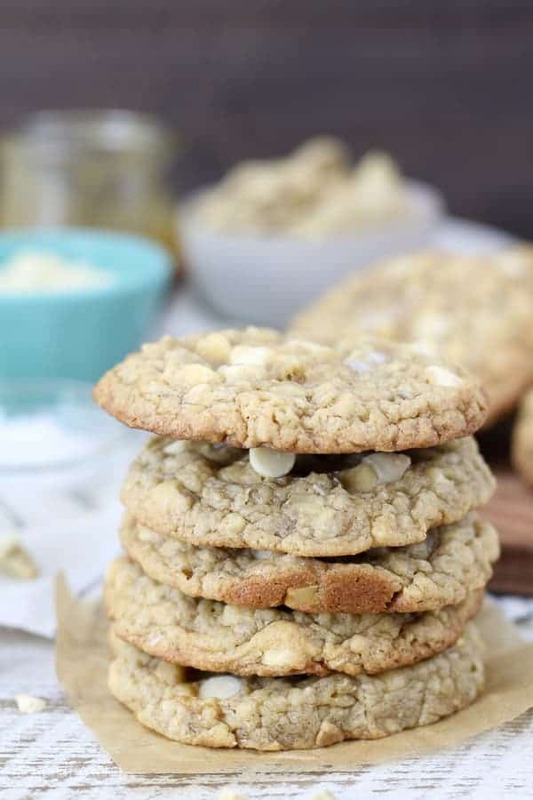 When your cookies come out of the oven and they do spread or are misshaped, take a flat edge, such as a knife and press the edges of the cookie back towards the middle of the cookie, shaping it into a circle. You can reshape them on the cookie sheet before it cools, so I suggest doing this immediately after them come out of the oven. I topped these cookies with some Maldons Sea Salt. 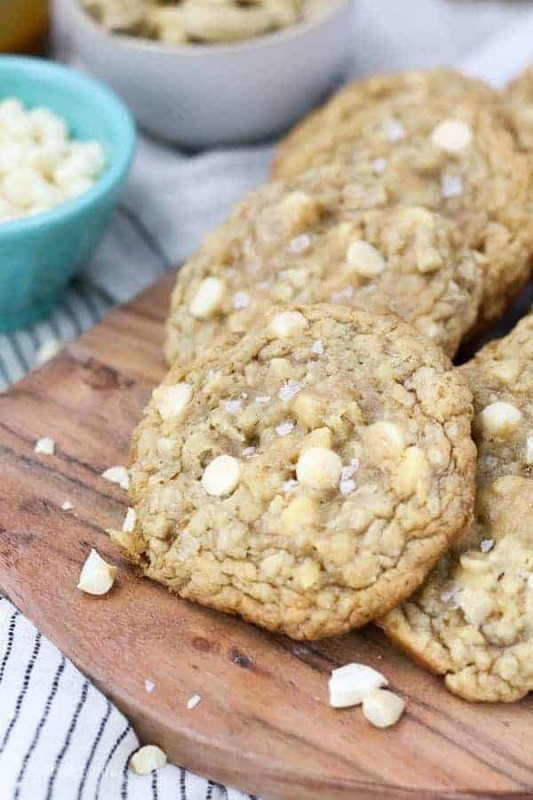 I swear I searched high and low for a nice flakey sea salt and I couldn’t find anything until I spotted Averie’s brown butter cookies and she so kindly hooked me up with her favorite sea salt. It’s like a whole new world for me. Booyah! 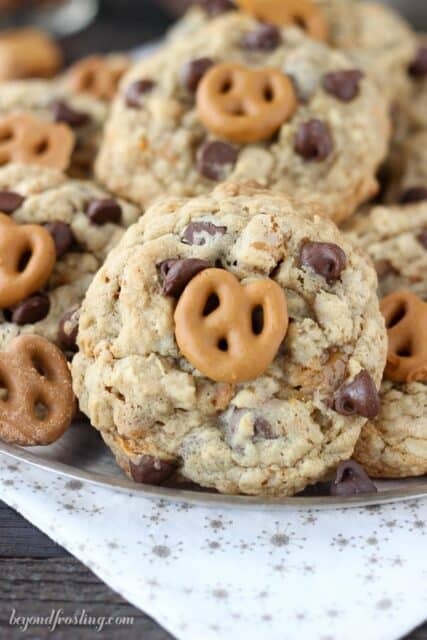 Now excuse me, I have more of these cookies in my freezer that are calling my name! In a microwave-safe bowl, combine caramel bites, milk and sea salt. Microwave in 45-60 second increments, stirring each time. Caramel will be very hot and can burn easily. Stir in 1 teaspoon salt. All the caramel to cool. Soften the butter in the microwave for 10-15 seconds. Combine the softened butter with the brown and granulated sugar. Beat on medium speed until well combined, 2-3 minutes. In a separate bowl, combine the flour, oats, salt (1 tsp) and baking soda. Stir to combine and slowly add the dry ingredients into the dough, mixing on low speed until dough starts to form. Before the dough thickens, add the chopped cashews and chocolate chips. Beat a couple of times until they start to incorporate. Once the caramel is melted and smooth, add to cookie dough. Beat just until combined. Pre-scoop the dough using a large cookie scoop and place on a sheet pan. Sprinkle with flakey sea salt. Refrigerate for at least one hour. Remove each batch 10-15 minutes before baking. Preheat the oven to 350° F. Line a baking sheet with parchment paper or a silicone baking sheet. Bake for 11-13 minutes. The center of the cookie should be slightly under baked but not too gooey. Allow to cool on the baking sheet for 5-10 minutes before transferring to a wire rack to cool. These can be frozen. Place on a cookie sheet with layers of parchment paper in between each layer. Once frozen transfer to an airtight container. Oh wow these cookies loos amazing! I have to try it soon!